We lost our Oriental poppies. Our big, beautiful, bright red Oriental poppies. The Oriental poppies we have grown since our Benjamin was a toddler. The seed pods of which he used as "salt-and-pepper shakers" when baking mud pies. Those oriental poppies. Earlier in the spring we thought one was returning. A mound of fuzzy basal leaves appeared between the phlox and the ruby spice summersweet. The weather was uncharacteristically cool and unsettled...and the poppy did not survive. When I picked out a new Oriental poppy at a local greenhouse the owner told me it would be a pink variety. She muttered something about "turn over the tags," and "some will be a mystery." I was holding a plant that looked like a young Oriental poppy. The tag (illustrated with a variety of Oriental poppies) reads, Oriental Poppy (Papaver orientale). On the back, written in permanent marker is the word "Pink." 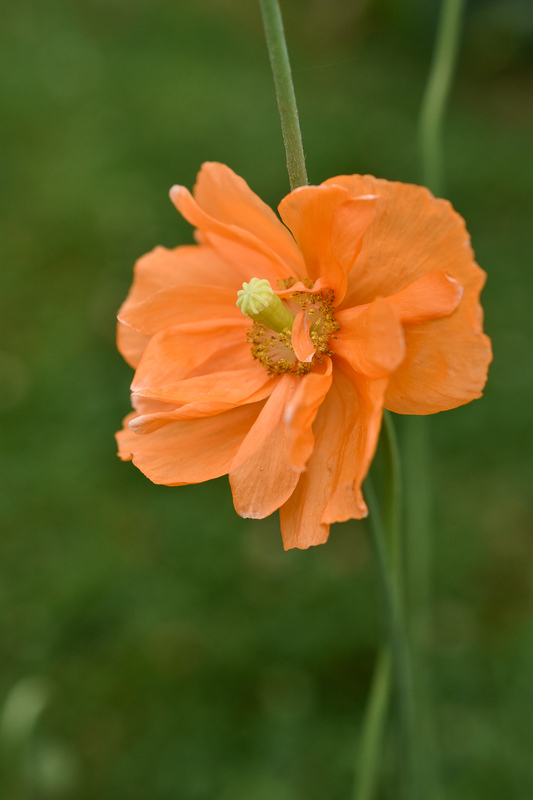 When a dainty, curved-stemmed, apricot-colored flower like the one shared above appeared in my cottage garden one morning I was too enamored to notice it is not an Oriental poppy. Atop graceful nodding stems, ruffled petals stole the show! Within a half an hour each of the petals fell to the ground below, leaving only what is to become a miniature version of my young Benjamin's "salt-and-pepper shakers." Dainty, nodding stems with apricot-colored blooms which last only an hour or so...this fleeting beauty is not my Oriental poppy, but if she self-seeds I will welcome her again-and-again!